Although Republicans have called for deep spending cuts since taking over the House of Representatives in the 2010 midterm elections, their austerity demands became even more extreme this year. The spending levels in this year’s House Republican budget are dramatically lower than the House Republican budgets from the past two years. In fact, last year, the House overwhelmingly rejected a proposal for severe austerity nearly identical to the budget it now embraces. This year’s spending cuts are so severe that the House Republican caucus has been unable to pass actual spending bills to implement its own budget plan, since those bills would have to make deep and specific cuts that are beyond the pale of what even most conservatives would support. House Republicans claim that their demands for more austerity are a response to exploding budget deficits, but in fact, the federal budget deficit is shrinking, not growing, due in part to massive spending cuts that Congress has already enacted. Those spending cuts were so large that Senate Democrats now accept spending levels equivalent to previous House Republican budget proposals. Yet House Republican leaders still insist on new spending cuts in exchange for preventing a government shutdown on October 1. The House Republican leadership is asking for spending levels that are about 8 percent lower than what they asked for in the past two years. In fact, if this year’s spending demands were in line with their previous demands, there would be no budget gridlock. That’s because the proposed level of spending in the Senate budget resolution for fiscal year 2014 is almost identical to those endorsed by the Republican caucus for FY 2012 and 2013. Most numbers in a budget resolution are nonbinding statements of principle, but the major exception is the overall limit on discretionary spending for the upcoming fiscal year. While spending for some programs such as Social Security and Medicare occurs automatically, Congress must approve discretionary spending every year in appropriations bills. These bills decide how to allocate funding within the budget’s overall spending limit to a wide variety of services, benefits, investments, and programs, including everything from national defense to infrastructure to research to the many other key sectors within the discretionary budget. For FY 2012 and 2013, the House budget resolutions authored by House Budget Committee Chairman Paul Ryan (R-WI) and endorsed by the Republican caucus proposed discretionary spending levels of $1,062 billion and $1,049 billion, respectively, adjusted to 2014 dollars. 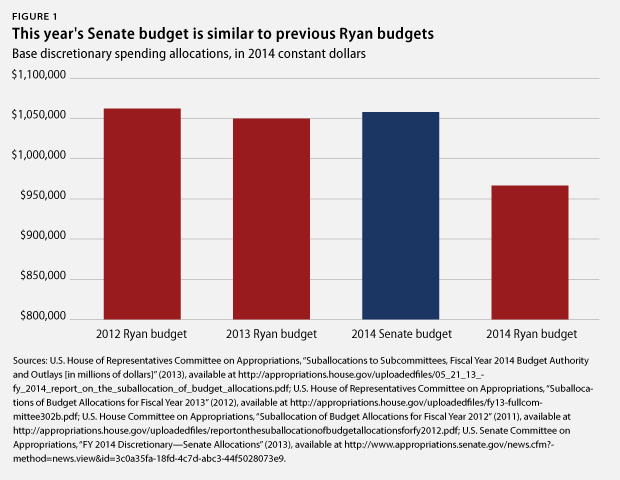 The FY 2014 Senate budget resolution authored by Sen. Patty Murray (D-WA) and endorsed by Senate Democrats advocates a discretionary funding level of $1,058 billion—just slightly higher than the 2013 Ryan budget and actually lower than the 2012 Ryan budget. If this year’s Ryan budget were in line with previous years, there would be little chance of a government shutdown because Democratic leadership in the Senate and Republican leadership in the House would be in agreement. Unfortunately, that is not the case. The current spending disagreement is entirely because the House Republican leadership is currently demanding an even lower spending limit than they endorsed just last year. 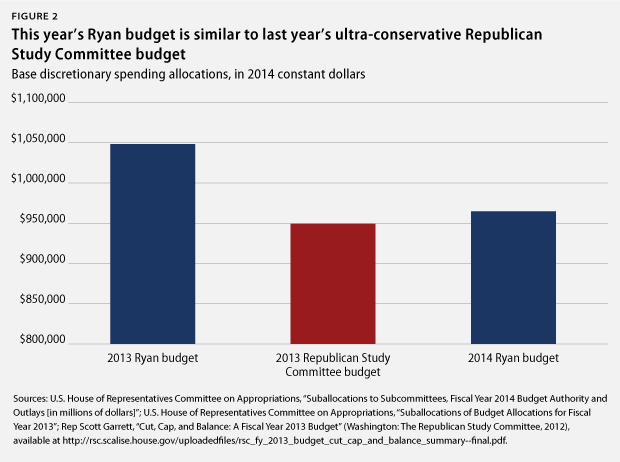 The Republican leadership’s call for an even lower discretionary spending level is far more extreme than previous Ryan budgets, but it is close to the austerity previously proposed by the ultra-conservative Republican Study Committee, or RSC. In 2013, the RSC budget called for $931 billion in discretionary spending, or $951 billion in 2014 dollars. The spending level now embraced by House Republicans is just 1.6 percent more than the RSC’s FY 2013 budget. Last year, the RSC budget was considered so extreme that more than 100 House Republicans voted against it when it was overwhelmingly rejected on the House floor. When the House Appropriations Committee considered only the discretionary spending cap in that budget, it was soundly rejected on a committee vote of 4 to 44. Senate Democrats now accept discretionary spending levels that are similar to previous Ryan budgets because Congress has already cut an enormous amount of discretionary spending—$1.5 trillion over 10 years, not including sequestration. After several tense rounds of negotiations over spending levels connected to preventing government shutdowns and raising the debt ceiling, Congress agreed to strict discretionary spending caps in the Budget Control Act of 2011. The Senate is working under these spending caps, while the House is demanding a new round of austerity. In FY 2014, the Budget Control Act will cut spending by 11 percent from inflation-adjusted FY 2010 levels, not including funding for wars and emergencies and not adjusting for other factors such as population growth. The overall spending cuts have been even deeper when wars and emergencies are included—so much so that we have actually exceeded the Republican Study Committee’s goal. 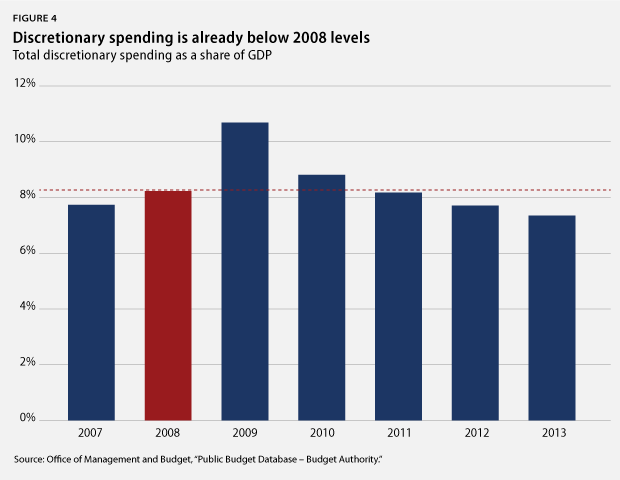 The Republican Study Committee has consistently called for freezing total discretionary spending at FY 2008 levels. 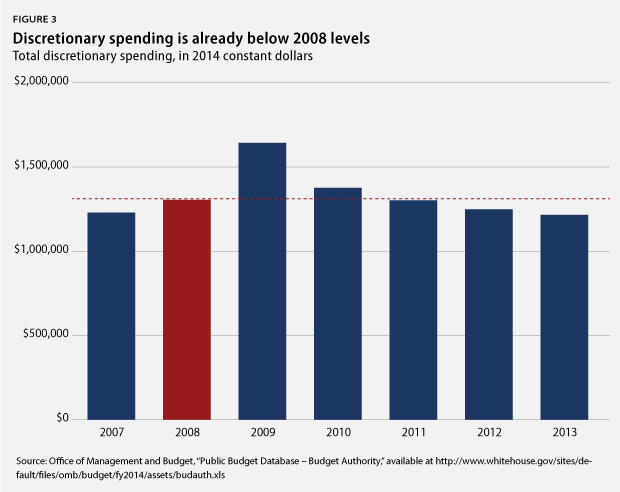 When all discretionary spending is considered, including for wars and emergencies, FY 2013’s enacted spending is already well below FY 2008 levels—even without the additional sequester spending cuts—both in overall size and as a share of the economy. 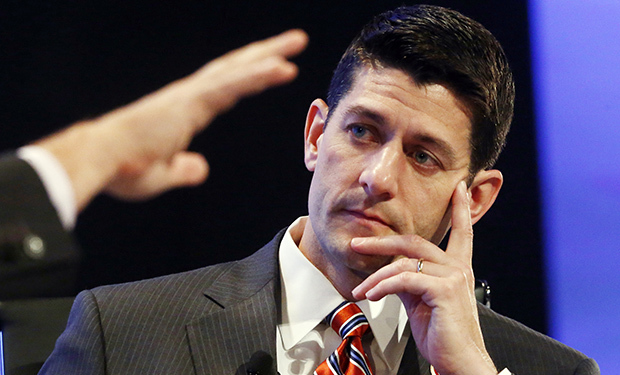 The consequences of the new austerity demanded by this year’s Ryan budget are becoming clear as the House Appropriations Committee produces—or in one case fails to produce—discretionary spending bills for FY 2014. These bills make deep cuts even when compared to the austere funding levels that the same committee approved one year ago. To be clear, the House Appropriations Committee was operating under very low spending caps last year, but this year’s proposed spending caps are much lower. 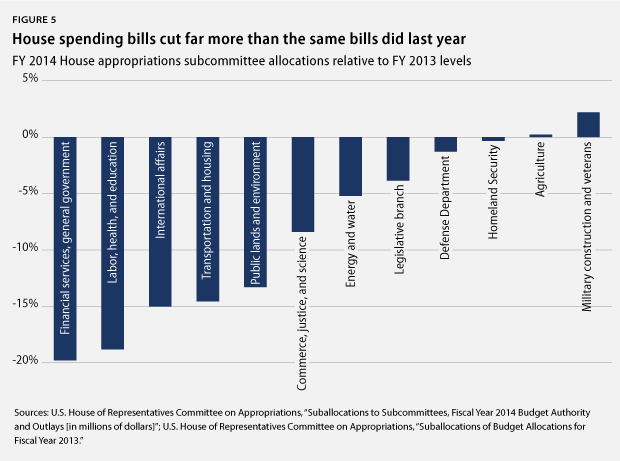 Congress approves discretionary spending in 12 annual appropriations bills, and the House reduced funding for some of these spending bills to levels that are far below what the House supported last year. That meant House members would have to find new places to cut, above and beyond the large spending cuts that they endorsed last year. But there were no easy cuts left within the areas targeted by the House. Instead, the House produced a series of spending bills that made deep cuts to programs that even House Republicans consider successful or at least necessary. The following programs would take particularly big hits, since they are funded by spending bills for which the House has allocated at least 5 percent less money than last year. ARPA-E: The House energy and water appropriations bill cuts groundbreaking research at the Advanced Research Projects Agency – Energy, or ARPA-E, to $50 million—75 percent less than the House supported last year. NASA: The House commerce, justice, and science appropriations bill provides $1 billion less for investment in exploration by the National Aeronautics and Space Administration, or NASA, than the same bill recommended last year. EPA: Last year, the House interior and environment appropriations bill supported $7 billion for the Environmental Protection Agency, or EPA, which was already a 17 percent cut. This year, the House would cut the EPA budget to $5.5 billion. CDBG: The House transportation and housing appropriations bill slashes more than $1 billion from the Community Development Block Grant program, or CDBG, bringing it to its lowest level in history. Just one year ago, the House supported an increase in CDBG funding, which supports state and local infrastructure, affordable housing, and social services. IRS: Last year, the House supported flat funding for the Internal Revenue Service, or IRS, in its financial services appropriations bill, refusing to provide the additional funds needed to implement health care reform but at least recognizing the necessity of tax administration. This year, the House would cut IRS funding by 24 percent. Some of these cuts were too much even for House Republicans. On July 31, House leaders abandoned efforts to pass the transportation and housing bill because members refused to support deep cuts to programs such as the CDBG. Amazingly, these examples only scratch the surface of the austerity demanded by House Republican leaders. That’s because the House has failed to even draft an appropriations bill for labor, health, and education. That bill alone was supposed to cut $35 billion, meaning that the House has yet to determine where it would make nearly half of the discretionary spending cuts required by the Ryan budget. Last year, the House of Representatives demonstrated an understanding that austerity could go too far when it rejected the extreme Republican Study Committee budget. Senate Democrats now accept spending levels in line with previous Ryan budgets, and the federal budget is stable over the medium term. Despite all that, House Republican leaders are demanding a new round of discretionary spending cuts. Hopefully, the House will relent on this extreme demand and agree to spending levels similar to those in past Ryan budgets, as it is becoming clear that even conservatives cannot support the specific cuts demanded by the new Ryan budget. If not, we can expect another round of dangerous political brinksmanship and the specter of a government shutdown. Harry Stein is the Associate Director for Fiscal Policy at the Center for American Progress.